One day I was hanging out in the company IT room and noticed a motherboard sitting facedown on the counter. Until then I never realized how beautiful the pattern of the connecting leads are. I took that idea and starting designing my business card. This is the 3rd iteration of the concept at a cost of triple the original satin finish card stock but definitely worth every penny. Eventually I hope technology will catch up to the point where I can cost effectively produce the cards I envisioned. Until then these will do. 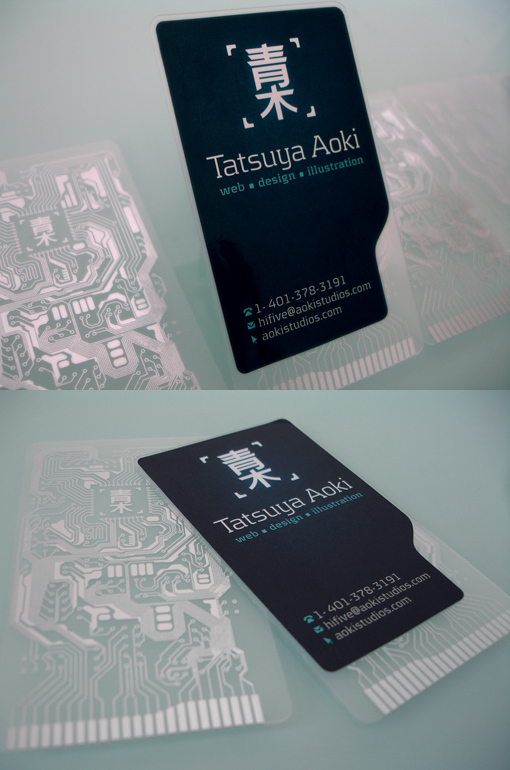 The base of the card is a 20mm frosted plastic with silver foil stamping produced by Dallas Card Works. The sticker is a custom die cut on 60lb semi-gloss paper from DPI Perfect.